This is an exquisite and richly divine soup made with cream, butter and macadamia nuts... its like vichyssoise Hawaiian Style!! Place 2 tablespoons of the nuts on a tray and roast until golden. Set aside. Place potatoes, leek, onion and stock in a large saucepan and bring to the boil. Reduce heat to low and simmer for 20 minutes or until potato is soft. Remove from the heat and set aside to cool slightly. Add the remaining macadamia nuts and blend in batches until smooth. Stir in cream, butter and season with salt and pepper. Serve chilled or hot, garnished with the roasted nuts and slices of toasted baguette. 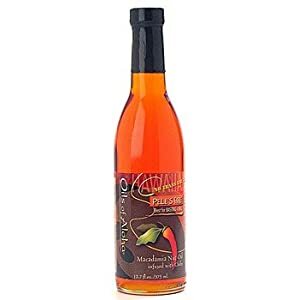 ** For a spicy twist, try topping your soup with Macadamia nut oil or Pele's Fire Macadamia Nut Oil! !